RMW architecture & interiors, is an innovative, award-winning architecture and interior design firm, with a collaborative culture. Our mission is to design engaging workplaces for great companies. We are currently experiencing exciting growth and seek an architectural designer 2 to work on a variety of commercial office and industrial projects in our Sacramento studio. As Architectural Designer 2, you will develop planning and creative design concepts for projects, directing the development of the client’s program and guiding the design so that it meets project requirements. You will be responsible for preparing presentations, design drawings, and design details. You will coordinate with the Project Manager on program, budget, and schedule for timely and appropriate design development. 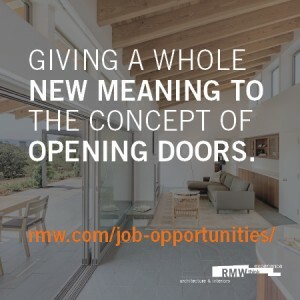 This position requires the ability to work independently on design projects, capably evaluating, selecting, and applying high-level architectural techniques, procedures, and criteria, and using judgment in making minor adaptations and modifications. You will coordinate consultants’ work during design phases and consult manufacturers to evaluate and select materials and finishes. The ability to demonstrate experience in coordinating project resources, including project consultants. Problem-solving skills with strong sense of design, color, and materials. A positive attitude with a strong aptitude for learning. Professional degree or recognized equivalent. 5-7 year of experience working on medium-sized projects of 15,000 SF+ with budgets of $2-10 million in construction. Proficiency in Revit, SketchUp, Adobe Illustrator, Photoshop, and InDesign. Experience in production of construction documents/architecture design. Knowledge in design development is preferred. For consideration, please email your resume and work samples to hr@rmw.com referencing the position title on the email subject line. No phone calls, please. RMW architecture & interiors is an Equal Opportunity/Affirmative Action Employer.